Cleaning and preserving your yard in the best conditions can be a hassle. Mowing the grass, trimming bushes and trees and cleaning up leaves is a lot work. Plus, tt adds up when you have kids. Kids leave their bikes, sports equipment and any other outdoor toys laying around on the yard. Cleaning and preserving your yard might be a hassle, but it’s an important and necessary chore. Conserving and tidying up lawn keeps pest away. Pest that became invaders and inhabit in your lawn don’t like clean places. When the grass is long and there is debris laying around the yard, it easy for small pest to nest and breed. Soon, those pest will wonder into your home and settle inside. A simple measure to keep pest from nesting in your lawn is to clean and preserve it well, and that requires hard work. Most lawns in Arizona only have grass, maybe two trees and a few bushes. By mowing the lawn, not only do you cut the grass, but also pick up various debris. Tall grass provides the necessary accommodations for ground bees, ants, grasshoppers, spiders, hornets, wasp and other insects species that make themselves at home in tall grass. Not all kinds of insects are deleterious, a few are beneficial. Nonetheless, having a lawn that is pest free is nice. Thus, cutting the grass is important. Not only does it help keep harmful pest away, but it makes your lawn look spectacular! In addition, it’s a healthy procedure for your grass’s health. Trimming and pruning bushes and trees is also another way to keep pest away. Trimming (cutting back overgrown branches and bushes) prohibits pest from nesting in your backyard. Pruning your trees and bushes (removing dead, loose or infected branches) eliminates the possibility of infection spreading and liquidate any small pest. Tent caterpillars, webworms, ants, termites, and other pest could attack your trees and bushes. It’s important trim and prune branches and bushes that are near to your house. Branches that are hanging over your roof or are close distance, can be a bridge to pest to stroll into your house. Bushes that are inches from your house foundation can provide the habitation for pest to wander in and out of your house, like mice and snakes. Trimming and pruning exposes the possible hiding places that pest can find. In addition to keeping pest away, trimming and pruning your trees protects your home from serious damages, and it’s a proper form to maintain the growth health adequate for your plants. Lawns that don’t have grass, but gravel, doesn’t mean that it less likely for pest to move in. Cleaning up leaves and any other debris is another method in keeping pest away from your lawn. . Scorpions, snakes, ants and other desert pest are attracted to gravel and rocks. It provides the appropriate shelter. Cleaning up leaves and debris also reduces mold and bacteria. Whatever falls to the ground, agricultural wise, means that it’s dead. Mold and bacteria feed on dead materials. Ranking leaves and any trash lay around reduces the probability of mold and bacteria to spread. This method helps you plants be free from infections, as well. The following list summarizes how to keep your yard pest free. Trim and prune your trees and bushes. Focus on branches and bushes that are over, touching or close range of your house. Click here to learn how to properly trim and prune your trees. Pick up trash and large objects from your yard. Once you’ve trim and prune your trees and bushes, properly dispose of the branches. Pick up any trash or large objects that are playing around on your yard. Mow your grass. After you all the trash is removed of the ground and other large objects, mow the grass. Mowing your grass will not only cuts the grass, but will also pick up leaves and debris from the ground. Living in Arizona, most houses don’t have grass, they have gravel. Simply by ranking and leveling the gravel, you’ll expose any debris. After that, just pick it up. Rearrange your yard. If you have any decoration, make sure it’s clean well organized. By following these five steps will maintain your yard pest free. 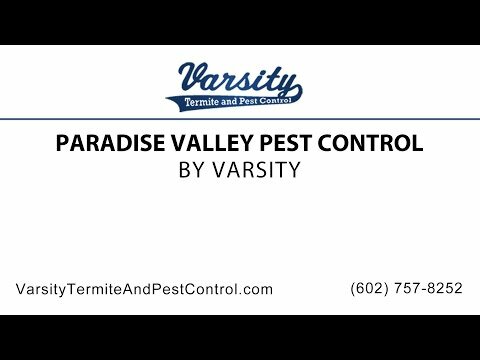 Contact Varsity Termite and Pest Control to learn more about how to keep your yard pest free. While you’re cleaning your yard and you come across pests or notice your plants damage, inspect them. Analysis what is causing damage to your plants, and identify the possible pest. After that, research the best possible solution. If the damage is advance and the pest problem is unmanageable, contact us. Varsity Termite and Pest Control will provide the best expert to inspect and/or exterminate pests in Glendale.